Channel 4 are currently running a season of programs to highlight the current problems with the way fish are caught off our coastline. I watched Hugh Fearnley Whittingstall's program the other night and it sent my blood pressure through the roof. It's a good job organisations like Channel 4 run programs such as these or I would never learn about the senseless waste of precious fish stocks. Most people know that the seas are over fished and you assume that EU fish quotas are set up to help this situation. Apparently not. I cannot believe that nearly 50% of all fish caught in the north sea are thrown back dead. Fishermen are not allowed to land over-quota fish such as cod and haddock, so they have no choice but to throw them back. You can read more about the campaign here. You can also keep up to date with the campaign by following @hughsfishfight on Twitter. 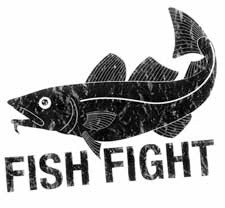 If you are interested in joining the campaign to send a letter to to Commissioner Maria Damanaki, members of the Common Fisheries Policy Reform Group, and all MEPs, check out the Fish Fight website. Over 94,000 people have already signed up which is great news. It's ceratinly made me think about the fish I buy and I'm going to try out some of the recipes over the coming weeks. Rather than joining the campaign...I changed my fish-buying habits years ago...I tell people about it at dinner parties etc. It's really important!! !